Last week I went to St. Lawrence market where I found some wild cranberries. They looked so fresh and amazing that I decided to buy some. I thought about all the wonderful and experimental things I could do with cranberries. Then I picked up my copy of Chez Panisse Fruit and looked up cranberries. 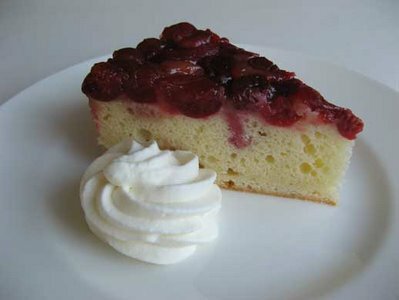 In the book I found a simple cranberry upside-down cake, I haven’t made an upside-down cake in ages! Although I really enjoy playing with flavours and all my cool gadgets in the kitchen, I also enjoy the art of simple baking. Use fresh seasonal fruit and the best ingredients to make delicious quality desserts. The vibrant red jewel like cranberries makes this cake look absolutely stunning. The texture of the cake is moist and the flavour of this cake shines with the tart cranberries complimented by the sweet brown sugar and orange glaze. I served the cranberry upside-down cake with whipped cream flavoured with Cointreau, make sure you add enough liqueur to get the full effect! I definitely recommend serving the cake with whipped cream. Yum! Use a 9-inch round or 8-inch square cake pan with 3-inch sides. 1. To make the topping, place butter and brown sugar in the cake pan. Place the pan on a stovetop burner over low heat and melt, stirring with a wooden spoon. When the mixture starts to caramelize, turning a slightly darker shade of brown, remove from heat and let cool. Scatter the cranberries evenly in the bottom of the pan and drizzle in the orange juice. Set aside. 2. To make the cake batter, sift the flour, baking powder, and salt into a bowl. In a large mixing bowl, using an electric mixer, cream together the butter and the sugar until pale and fluffy. Mix in the vanilla. Add the egg yolks one at a time, scraping down the sides of the bowl after each to make sure it is thoroughly incorporated. Gradually add the dry ingredients and the milk in stages: mix in about a third of the flour mixture, followed by about half the milk, mix in another third of the flour, then the rest of the milk; finally, add the last third of the dry ingredients. 3. In another large mixing bowl, whisk together the egg whites and cream of tartar. Beat the whites until they form firm peaks. Fold the whites into the batter in two batches. Pour the batter over the topping in the prepared pan and bake until the top is slightly brown and the cake pulls away from the sides of the pan, about 50 to 60 minutes. Let the cake cool for 15 minutes. Run a knife around the edges of the pan and invert the cake onto a serving plate. Serve with lightly sweetened whipped cream flavoured with a little orange liqueur. Serves 8. Posted by Sam at 11:06 p.m.
Oh what a lovely looking moist crumb. I can just imagine the tang of tart wild cranberries exploding in my mouth. You have captured it all! I made cranberry upside down cake too. Must be something in the air. Yours looks wonderful. These really do look like gems and I bet they make the cake.I love the crumb/texture of your cake. Great recipe! This would look so gorgeous on any holiday table. I'm so glad i found your blog, Sam. Sam: I am so glad you posted this recipe as my copy of the Chez Panisse cookbook is in storage. I have made the upside down plum cake and plan to create it now with new-season apricots. Lovely blog. Thank you.